TOKYO—Search and rescue teams found wreckage from a crashed Japanese F-35 stealth fighter in the Pacific Ocean close to northern Japan, and are scouring the waters for the missing pilot, authorities said on April 10. The aircraft, less than a year old, was the first F-35 assembled in Japan and was aloft for only 28 minutes on April 9 before contact was lost, a defense official said. The plane had logged a total of 280 hours in the air, he added. It was only the second F-35 to crash since the aircraft’s first flight in 2006 and could reignite concern about the F-35 having only one engine. Manufacturer Lockheed Martin is competing for orders in Finland and Switzerland against the twin-engined Eurofighter Typhoon and Boeing F/A-18E/F jet. 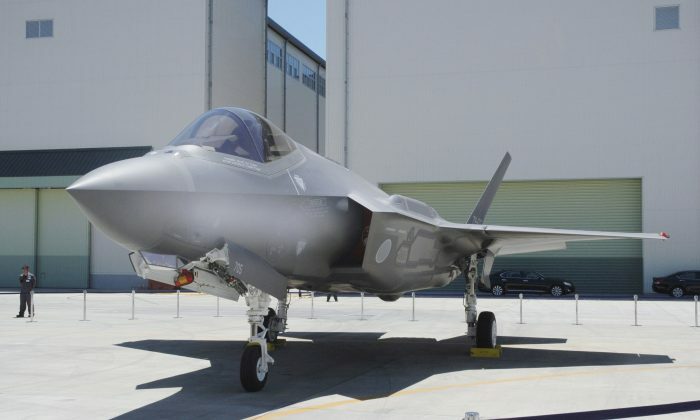 The accident could influence Switzerland’s decision, but Finland could still pick the F-35 as it is close to Russia, said Justin Bronk, a research fellow at the Royal United Services Institute in London. The advanced, single-seat jet disappeared in good weather about 135 km (84 miles) east of the Misawa air base in Aomori prefecture, the Air Self Defense Force said. “We recovered the wreckage and determined it was from the F-35,” a spokesman said. Eight ships and seven aircraft, including a U.S. Navy P-8 Orion maritime patrol plane, joined the search and rescue effort. The aircraft was leading three F-35s on training maneuvers when it sent an “aborting practice” signal and disappeared from radar, Defence Minister Takeshi Iwaya told reporters. The pilot, who had 3,200 hours of flying time, but had spent only 60 hours in the F-35, gave no other indication he was in trouble, the ASDF spokesman said. “We’ll need to cooperate with the U.S. forces and I believe arrangements are being made,” Iwaya said, adding that the cause of the incident would have to be determined. The crashed aircraft was the fifth delivered to the ASDF, but the first assembled by Mitsubishi Heavy Industries in Japan, a second ASDF official told Reuters. Japan’s 12 remaining F-35s are grounded for now, he added. The previous four were used for training in the United States before being brought to Japan, the defense official said. No other countries operating the F-35 have grounded their stealth aircraft. The Pentagon said on April 10 that it was not grounding its fleet of more than 250 U.S. F-35 fighter jets but was monitoring the situation. A spokesman for South Korea’s defense ministry said there was no plan to ground that country’s newly delivered F-35s, as there were no recommendations from the United States to do so. Britain said it was reviewing the status of its 17 F-35B fighters for now. The Italian Air Force said they were reviewing the status of the Italian F-35A closely with the Joint Program Office, but at the moment there was no evidence the crash was due to technical problems and the fleet was flying regularly. A representative for Mitsubishi Heavy Industries Ltd said it had no immediate comment. The company assembles the aircraft at a plant near Nagoya in central Japan. The lost aircraft cost 14 billion yen ($126 million), several million more than one bought directly from the United States. The aircraft crashed in waters whose depth reaches about 1,500 meters (4,920 ft), making recovery, particularly of its flight data recorder, or black box, difficult, the official said. Without the device, investigators could study the aircraft’s classified communications and data sharing system for clues, an industry source said on condition of anonymity. The ASDF received the aircraft, designed to penetrate enemy defenses by evading radar detection, last May, its spokesman said. Japan’s first squadron of F-35s has just become operational at Misawa, and the government plans to buy 87 of the stealth fighters to modernize its air defenses as neighboring China and Russia upgrade their military forces. Lockheed said it was standing by to support the Japanese Air Self Defense Force as needed. The crash was the first of the A variant of the fifth-generation fighter. A U.S. Marine Corps short take-off and landing (STOVL) F-35B version crashed near the Marine Corps Air Station Beaufort in South Carolina in September, prompting a temporary grounding of the aircraft. Lockheed also makes a C version of the fighter designed to operate off carriers. Japan’s new F-35s include 18 STOVL B planes it plans to deploy on its islands along the edge of the East China Sea.